When daydreaming about perfect handbags, most fashionable folk would dream of the Chanel 2.55 or a Birkin bag (not that those aren't fabulous, of course), but me? If cost was no object? My bookshelf turned bag-shelf would be filled to overflowing with a perfectly chic library of Olympia Le-Tan book clutches. I've posted about my love for these bookish beauties before, but when I spotted this gem among Net-a-Porter.com's new arrivals I was smitten. 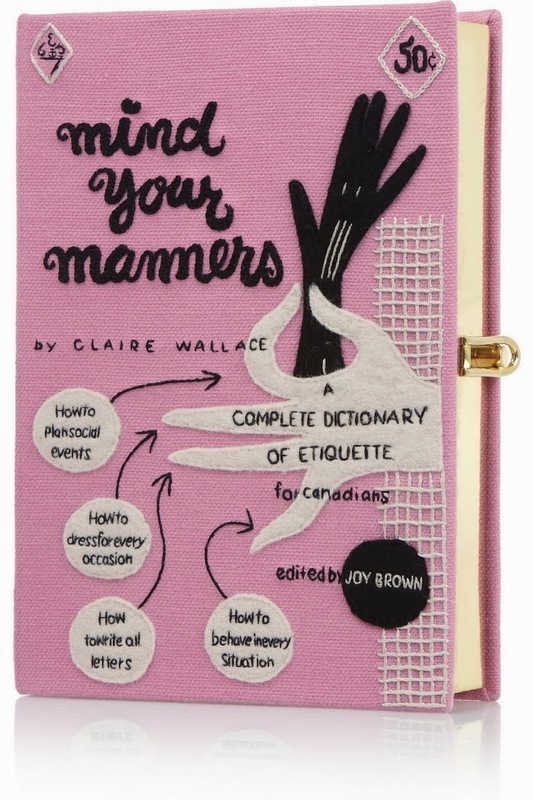 It's pink, it's modeled on a book of etiquette - for Canadians no less! Could it be more perfect? I think not. Ugh I've caught these online and want one SOO bad!! There couldn't be a more perfect combination!